Founding Jive Software CEO Dave Hersh defined the enterprise community and collaboration category from 2001 up to the company’s 2011 IPO. Since then, the space has changed dramatically as businesses have realized the importance of building engaging, valuable communities of professionals and supporters. 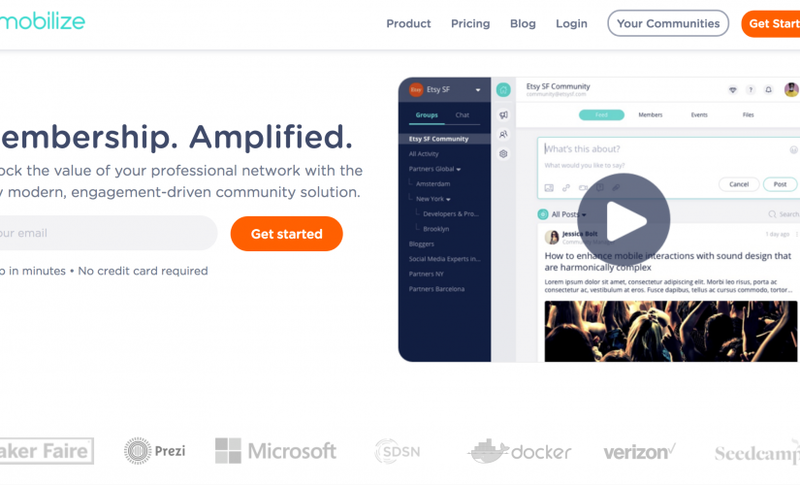 So it may come as a surprise to learn Hersh recently acquired Mobilize Networks, an engagement platform for membership-based organizations whose customers include The United Nations, Prezi, Docker, Maker Faire and some 1,000 others. With this acquisition, Hersh has assumed CEO duties at Mobilize while partnering closely with founders Sharon Savariego and Arthur Vainer. What did he discover about Mobilize, and can he teach an old category new tricks? We sat down with him to find out why this space is still interesting to him, eight years after he left Jive. RW: Most entrepreneurs are so fixated on the future, they never take a second look at a product or category. Enterprise community software certainly made its impact a few years back … but why are you going back into it now, with Mobilize? Hersh: Mobilize meets a specific, acute need: it allows membership-based organizations to build and manage modern professional networks. The technology their members use in their consumer lives is vastly better than the antiquated ways in which organizations are attempting to engage them. As a result, organizations are falling behind, and members are tuning out. But Mobilize changes that: it’s the first modern, purpose-built solution to amplify engagement and fuel member retention and growth. It’s a solution, not another general use platform, so it meets the unique workflow and engagement needs of member-driven communities. RW: How does a typical organization communicate with its members? Hersh: Email and general-use platforms mostly. You’ve probably experienced it yourself as an alumnus or association member. Many use one-size-fits-all solutions like community platforms or Google Groups, which weren’t created for their needs and have an antiquated user experience. It’s hard to find the content and people you need or stay connected to the group. Typically, organizations will roll out tools in succession to see if anything sticks. But they rarely gain traction, which costs them credibility and leaves members feeling less seen, heard and valued than ever. RW: What kinds of organizations are we talking about? Hersh: These are purpose-led organizations like trade associations, nonprofits and professional networks for corporations. This is not about customer support – it’s about engaging with and mobilizing networks of professionals and supporters behind a shared purpose. In 2018, people care deeply about these topics and organizations – they just need a better way to plug into them and feel a sense of belonging. RW: There are many competing solutions … what makes Mobilize unique? Hersh: Actually, there’s nothing else like Mobilize for this use case. Mobilize was created by, with and for community managers in membership-based organizations. It’s the first member engagement platform to combine a community social space, outreach tools, member directory and CRM in a purpose-built solution that amplifies engagement to fuel retention and growth. We’ve seen engagement increase by 2X-3X when organizations switch from these generic platforms to Mobilize, and aim to get that to over 10X over the next year with an aggressive roadmap and team of experts to assist our clients. RW: Who created the platform? Hersh: Mobilize was launched in 2014 by Sharon Savariego and Arthur Vainer, two amazing, passionate people whose vision and commitment got us to where we are today. I’m really happy that Sharon will stay on as Chief Product Officer and Arthur is assuming the role of Chief Technology Officer and wouldn’t do this without them. It’s a great team. RW: What’s Mobilize’s secret sauce? Hersh: It’s a combination of features that enable specific workflows for community managers, and a modern interface with a strong consumer sensibility to ensure members stay active. For example, Mobilize has an accessible-everywhere interface across the web, mobile and email. So it’s not “one more tool” but a simple approach that goes to where the user likes to work. These features allow community managers to focus on growth, not wrestling with tech and trying to convince people to use it. RW: What’s next for Mobilize? Hersh: We will add more engagement features and analytics to help our customers, and enterprise functionality for large-scale communities. But most importantly, we want to prioritize the people over the technology. Technology should serve connection and belonging. Beyond just a guiding philosophy, this translates into specific actions like adding team of consulting experts focused on driving outcomes for customers. It’s one of the main reasons I got back to this category, and I’m very excited to help these amazing organizations again.